A few weeks ago I found myself in the middle of California’s central valley, standing on the edge of a road with straight lines of fruit trees stretching regimentally in every direction. It is a totally flat landscape – more like the Midwest than most people’s image of California. On a clear day I probably could have seen the Sierra Nevada mountains distantly to the east, but it was January – not cold exactly, but on the chilly side for California. It was cloudy and dusk was beginning to set in. As I stood on the edge of the highway, there was no sign of any one else – the occasional car sped past, and in the distance I could hear the hum of some kind of farm machinery, but that was it. There was a concrete memorial there, though, to commemorate a gunfight in 1880 in which seven people lost their lives. For a while the killings at this place – then known as Mussel Slough (pronounced slew apparently, though at the time I assumed it was the same as the place that friendly bombs were supposed to drop on)– electrified the country and even caught the attention of London newspapers. It inspired sage commentary from Karl Marx on the coming crisis of capitalism he thought it betokened. (Marx would, I like to think, have pronounced the place name to rhyme with plough, as in ‘slough of despond’). 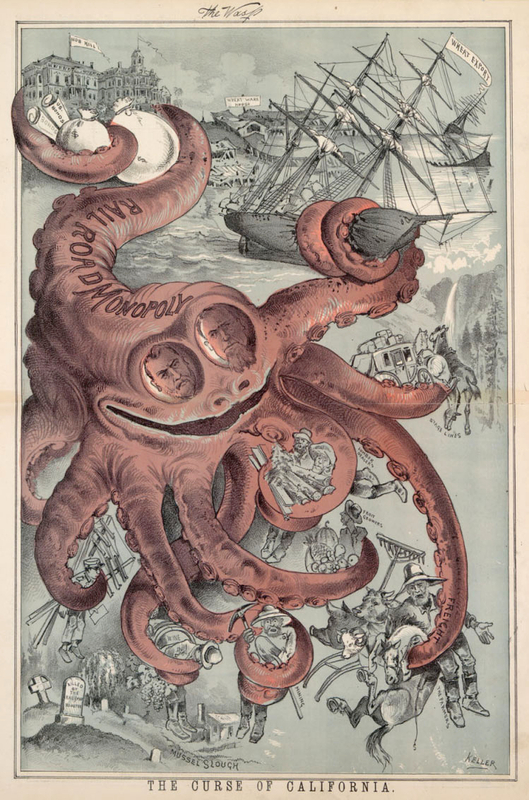 A few years later, a novel The Octopus: A Story of California featured a lightly fictionalized account of what occurred at Mussel Slough. It became fixed in the minds of Californians and Americans generally as a shocking example of the callousness of a big corporation – the Southern Pacific Railroad in this case, whose power over Californian life and politics in this period was legendary. The story of the Mussel Slough gunfight raises questions not only about political tension in the nineteenth century West at a moment of corporate consolidation, but also about the difficulties of recovering the reality of the conflict from beneath multiple layers of propaganda. (I’ve written a post summarizing some of the historiography here.) In essence – to cut a very long story short – men lost their lives at Mussel Slough because the railroad got a court order to evict from a plot of land a settler who had not paid for the plot but was claiming the right to it, or at least to buy it cheaply. The railroad, said the courts, owned the land and could therefore sell it to whoever they chose and whatever price the market would bear. The settlers thought they were being railroaded – what they called their “Little Eden” sold from under them. The story of corporate Goliath against plucky settlers is muddied by evidence that the settlers were trying to pull a fast one – they had come to the area knowing full well that there were legal questions about the status of the land, but the courts had ruled repeatedly in the railroad’s favour. The settlers were led by a former Confederate officer and post-Civil War sectionalism seems to have played a role here, since the Southern Pacific was led by outspoken antislavery Yankees. And the settlers had formed a Land League to defend their homes directly modeled on the hooded, intimidating terrorist tactics of the Ku Klux Klan. So the “plucky settlers” – as in the best Westerns I suppose – were hardly whiter than white. And nor was the railroad all bad, since as Richard Orsi has shown in his authoritative history of the Southern Pacific, far from trying to squash homesteading, it was in their interest to encourage it. (We may assume that Jeffersonian agrarian ideals were antagonistic to the onrush of industrial capitalism, but in reality, each supported the other in the late nineteenth century.) There was incitement on both sides – the Land League were clearly threatening, but the railroad police and some of the locals who sided with the railroad also seem to have been highly provocative, not least the man who shot five men than day, one Walter J. Crow, who by rights should be as famous a western gun-slinger as Wyatt Earp or Billy the Kid. Why had I come to this now-quiet place so full of ghosts? Not just because I’m the sort of historian who likes to go to the places he reads about, but because I was making a radio programme about the ways in which California has been the site of conflicting Utopias – and this seemed as good a place as any to come to see how and why that happened. California was always as much a place of the imagination as a reality – or, rather, the two have always been hard to separate. The El Dorado of the New World was made reality after the discovery of Gold. Before that, Catholic missionaries and Spanish adventurers colonized a bounteous land of apparently peaceful Native American civilizations. And of course in the twentieth century California was the place boosters pushed as a land of leisure, of sunshine and oranges, of Hollywood glamour and easy charm. 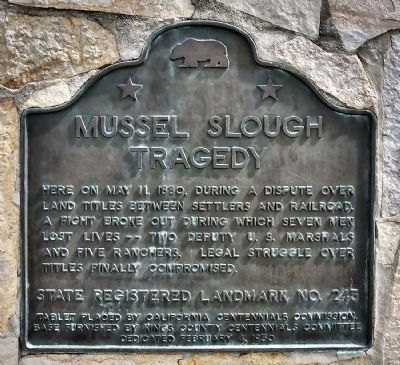 That gunfight at Mussel Slough was a conflict between two visions of the good society – a no-compromise clash between people who, for a mixture of motives, believed that in coming to California they could pursue a particular dream, one which came into deadly conflict with that of others. And that has been true again and again – from the mid-twentieth century suburbanites building their ideal communities and wanting to build walls against outsiders to the San Francisco progressives today who feel that the new tech-Utopians of Google and Twitter are destroying their paradise.